Appropriately nicknamed the “Last Frontier,” Alaska is a virtual wonderland for outdoor enthusiasts—a place whose warmer months makes it the perfect state for camping and pursuing a wide range of other outdoor activities. Alaska is the largest state in the union from a geographical standpoint, the 3rd-least populous state and, by far, the least densely populated state in the United States. Situated in the northwest extremity of the North American continent, Alaska borders the Canadian territories of British Columbia and the Yukon to the east; and shares a maritime border with Russia to the west across the Bering Strait. To the north of the state lies the Chukchi and Beaufort Seas—representing the southern parts of the Arctic Ocean—and the Pacific Ocean can be found to the state’s south and southwest. Counting its territorial waters, Alaska is larger than the next three largest U.S. states combined, and boasts more pristine campgrounds than any region in the (combined) Americas. Thousands of outdoorsmen (and women) flock to the state each year to test their limits amid the harsh Alaskan countryside, including fishermen, hunters and survivalists looking for the ultimate test of man against nature. 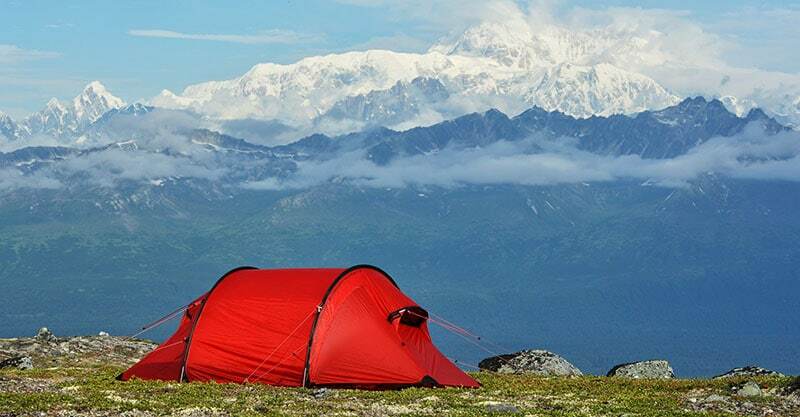 In the following article we have highlighted five of Alaska’s most popular campgrounds, and provided a description of each site’s amenities, facilities and the available activities to pursue while staying in each campground—activities that campers throughout the world have come to love and embrace when visiting this majestic and massive wilderness. Campers who enjoy the sport of extreme canoeing will thoroughly enjoy their experience at the Alaska Canoe and Campground. Situated in the town of Sterling, Alaska, the campground is located at milepost 84 on the Sterling Highway, approximately one mile beyond the town of Sterling and on the road headed towards the town of Soldoma. The Alaska Canoe and Campground is a privately-owned Recreational Vehicle camp that closely abuts the roaring Kenai River, the Swanson Lakes canoe system and nearly a dozen lakes found along the winding Skilak Road. A staple of the Sterling community and beyond, the Alaska Canoe and Campground is one of the most popular spots in the region for outdoor adventure. Whether you have your own canoe or kayak and you’re looking for a great place to launch, or you need to rent one of the many available canoes at the camp store and marina, this prime location offers hours upon hours of unbridled fun and enjoyment, in a state known for its rugged wilderness and rapid rivers. The twenty-five campsites available at the Alaska Canoe and Campground are all very spacious and pristine, and are able to accommodate both large and small groups. RV campers will have access to water and electrical hookups, as well as all of the other amenities the park offers. Some of these bonuses include full restrooms with flush toilets; drinking water (during the summer); picnic shelters with tables and benches; BBQ grills and campfire pits; and much, much more. In addition to the fantastic canoeing and kayaking available at the Alaska Canoe and Campground, guests can participate in a number of other activities, including hiking, nature walks, fishing and playgrounds for the children in the group. All campsites at this beautiful park are booked on a first-come, first-served basis, with the 8-10 waterfront campsites being the most popular among local residents. Located in the unique town of Chicken, Alaska, the Chicken Gold Campground (and RV Park) is a true local gem and a wonderful place to camp under the electric Alaskan sky. The campground can be found just off the Taylor Highway, a rustic and scenic drive that is very representative of the adjacent wilderness that defines this area. The Chicken Gold Campground and RV Park, which boasts a rich mining history dating back to the 1800s, is a serene and very peaceful camping destination that is bursting with local flora, fauna and folklore. This premier camping area offers a number of options in terms of lodging, including spacious tent camping areas, pull-through RV sites and a number of small, yet cozy cabins for those who prefer the “four-walled” camping experience. The campground is adored locally for its many amenities, which include public, full-service restrooms; purified drinking water (in the summer months); grilling stations with adjacent picnic shelters, tables and seating; fire rings designed specifically for campfires (and the making of S’mores); a tasty café; and a gift store that sells everything from camp supplies to T-shirts to local memorabilia. The Chicken Gold Campground has many available activities to pursue, not the least of which is a guided gold panning area where families can get a true taste of the mining experience as it was over 100 years ago. Of the 25 campsites hosted by this great park, 20 are equipped with both electrical and water hookups, ensuring RV campers can take full advantage of everything the Chicken Gold Campground and RV Park has to offer. The Chicken Gold Campground is located in the very heart of Chicken, Alaska on the Chicken Loop Road. To get here, guests will want to take the Airport Road exit off the Taylor Highway (mile 66.4) and take the first or second left, both of which lead to the park’s entrance. Located in the town of Talkeetna, Alaska, the Montana Creek Campground is positioned along the renowned Glenn Highway. Among other fantastic characteristics, the campground is celebrated for its proximity to some of the best fishing the state of Alaska has to offer, where anglers can fish for species that include rainbow trout, and several types of Alaskan salmon, including pink salmon, chum salmon, king salmon and silver salmon. The family-friendly Montana Creek Campground offers a number of other activities and amenities for campers to enjoy. Some of these features include a paved path that is ideal for hiking, jogging and biking. The path has underpasses at the George Parks Highway and a unique bridge that spans the wide and rushing Montana Creek. Like Alaska itself, the campsites at the Montana Creek Campground are very spacious and secluded—a nice break from some of the other campgrounds around the country that are crowded and busy with people. There are a total of 67 campsites at this wonderful park, of which 44 are designed for tent/camper-style camping. The other spots are pull-through RV campsites, complete with both electrical and water hookups. Among the many amenities and conveniences at the Montana Creek Campground are restrooms with flush toilets; picnic areas with covered shelters; BBQ grills and fire rings at each of the 67 campsites; drinking water; and a playground area for the children in your group. There is also a camp store conveniently located on the premises where campers can purchase camp and fishing supplies, including bait and tackle, ice, cold drinks, groceries and more. The Montana Creek Campground is located just 110 miles from the large city of Anchorage, Alaska where the Montana Creek crosses the George Parks Highway; and 275 miles away from Fairbanks. All tent sites are available on a first-come, first-served basis; while the RV sites can be reserved up to 6 months in advance. Located very near the town of Copper Center, Alaska, the Klutina River Campground is one of the most well-liked camping destinations in the state. The campground is especially popular among the state’s many fishermen—a group that, every summer, can be found on the wide banks of the vast Klutina River, where many species of freshwater fish abound, including several different types of trout and salmon. Known mainly as an RV-style campground, although tent sites are available, the Klutina River Campground features sites that are very level and conveniently positioned on well-packed gravel. Most of the campsites here offer riverfront access, allowing campers to take part in the sport of fishing without ever leaving the comfort of their campsite. In addition to being a fisherman’s paradise, the Klutina River Campground is also a popular destination for families. Hiking and walking paths are a great addition to the park, allowing families to explore the vast Alaskan wilderness without having to venture off the beaten path. There is also a huge playground that guarantees children hours of fun. Every Tuesday night at the Klutina River Campground, the Klutina Salmon Charters hosts a bonfire and ice cream social, and all guests of the park are encouraged to attend. The Klutina River Campground has a total of 53 campsites, all of which can be accessed by trailers and RVs (40 feet and under). 30-amp electrical power is available at each of the campsites, as is potable water. There are also a handful of cabins available at the park, each of which rents for $85 a night. To get to the Klutina River Campground, guests will need to drive roughly 180 miles from the town of Anchorage, Alaska. The drive will take them through towns such as Palmer and Sutton and past the gorgeous Mat Glacier—a site that is definitely worth a stop if only to take a few photos. Situated very near the large city of Fairbanks, Alaska, the Tanana Valley Campground and RV Park is one of the most popular campgrounds in the state. Located at 1800 College Road, the wonderful campground offers a rustic and secluded camping experience, one that features both tent (non-power) campsites and RV pads that include both electrical and water hookups. Bounded by massive groves of pine and birch trees, the campsites at the Tanana Valley Campground and RV Park offer a private and sheltered experience of authentic wilderness camping. And while the campsites are indeed secluded, campers looking for modern conveniences can easily head to the nearby town of Fairbanks and get everything they need to make their camping adventure truly memorable. There are a total of 50 campsites at the Tanana Valley Campground and RV Park. Thirty of these sites are designed for RV camping, while the remaining twenty sites are set up for tent camping, with lush vegetation separating each campsite from the next. The campground features a general store, picnic area, BBQ grills, fire rings, restrooms (with showers) drinking water and trash bins at each site. Many of the sites also offer free Wi-Fi, allowing you to power up some of your favorite devices.